Following reports that the HTC U was set for unveiling this month, specifications for the device are being outed by what appear to be official HTC documentation. You can choose to take the source material seriously or not, but things do seem to be aligning rather well for a U unveiling later this month. According to what is shown, the HTC U will be a pretty straightforward 2017 flagship, with exception to a few extra sensors that will allow users to input commands via the sides of the device, not just the touchscreen. As of right now, it’s reported that the U will feature a 5.5″ WQHD display, Snapdragon 835, 4GB RAM (6GB in select markets), 64GB/128GB storage options, 3,000mAh battery with Quick Charge 3.0 technology, 3D Gorilla Glass 5, fingerprint reader, and Android 7.1+. Honestly, if you were designing your own phone, these specs are pretty much your starting point for a flagship in 2017. And to be clear, that’s a good thing. Now, onto the more interesting stuff, which includes this thing called the Edge Sensor. As reported before and backed up by this latest intel, HTC is building in additional touch sensors into the edges of the phone. With these sensors built-in, the phone will be able to feel various types of squeeze and presses. For example, you can program a squeeze that prompts Google Assistant, or a squeeze that opens up your camera. The point is, no longer will you need to unlock your phone to begin certain actions; a few squeezes are all that’s required. 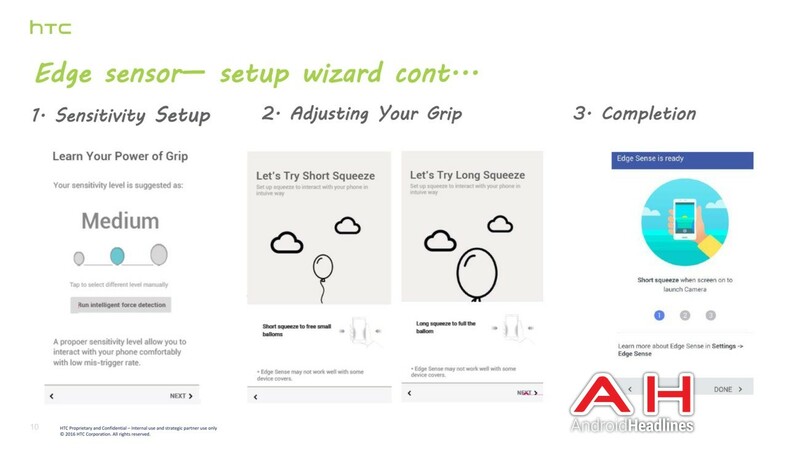 The below image is taken from the documentation that was leaked, detailing the setup wizard for the Edge Sensor. We probably still have a bit to go before HTC confirms the existence of the U, then subsequently unveils it, so we won’t spend too much time speculating as to what you might be able to accomplish with a phone you can squeeze in various ways. Frankly, it’s odd to me, and I had initially expected just a touch-powered volume rocker or something along those lines – not actual sensors that can be squeezed. Odd. Let me know your take on the HTC U and its reported Edge Sensor. I’m dying to know.